Luxury Pre Pitched Glamping Style Tents at our Belgian Grand Prix Campsite! A choice of fantastic glamping style tents that provide you with comfortable accommodation with added style and plenty of Wow factor! Our collection of Fantastic Glamping Tents provides glamping-minded guests the perfect weekend home to stay in, there’s no tent to pitch when you arrive so all you’ll have to do is relax and enjoy the unique Grand Prix Glamping experience. These fantastic tent designs will ensure an unforgettable Glamping experience with the added benefit of an exclusive backstage VIP lounge as part of the Camping F1 central functions marquee. Our tents are equipped to help ensure each guest is comfortable, offering comfy beds and quality linens, towel sets and toiletries. For the morning enjoy a healthy continental breakfast with freshly baked pastries and breads, or opt for our full English breakfast buffet for a good start to your day. Private backstage lounge with comfy sofas, great music and dedicated bar, the perfect place to enjoy the evening before retiring to the comfort of your individual Glamping retreat! Formula 1 Tickets & Grand Prix Glamping Packages. Please contact us for package offers, we can include GA or Grandstand Tickets, Ferry Tickets & Circuit Parking. Thu 8pm - DJ Welcome Party! Sun 6pm - Grand Prix After Party! 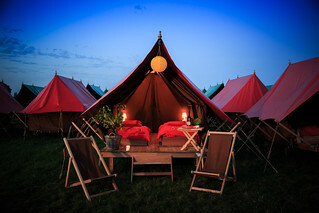 View all Prices for the Belgium F1 Glamping.